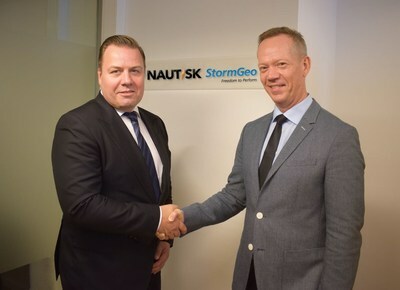 BERGEN, Norway, Sept. 4, 2018 /PRNewswire/ -- StormGeo, a world-leading provider of weather intelligence and decision support services, today announces it has entered into an agreement to acquire Nautisk, a leading global supplier of maritime charts and publications to the merchant marine from NHST Media Group. The combination allows StormGeo to be the first to integrate market-leading routing and weather services with state-of-the-art charts and publications solutions. StormGeo Acquires Nautisk. Pictured left to right, Thomas Fjeld, Nautisk CEO and Per-Olof Schroeder, StormGeo CEO. According to Per-Olof Schroeder, CEO of StormGeo, "The acquisition of Nautisk is a natural complement to our existing solutions to the global shipping industry. In recent years, Nautisk has developed state-of-the-art software for use in planning and navigation, while maintaining one of the industry's best run operations for delivering paper charts and publications to vessels worldwide. The power of the combined StormGeo-Nautisk solution will directly benefit customers as we advance our vision as a premier shipping services player. We are proud to lead the industry in creating the first, fully-integrated navigational planning solution in the market." This new, all-in-one platform will allow StormGeo and Nautisk customers to optimize routing, obtain appropriate charts, and create a voyage plan without switching between disparate systems. Integrating navigational information with weather intelligence and proprietary route optimization algorithms will enhance quality and offer significant usability and cost benefits to customers. "The Nautisk team is excited about combining with such a trusted company within the shipping community and beyond," said Nautisk CEO, Thomas Fjeld. "Our complementary offering means that together we can provide a solution that has no rival and will drive usability, provide richer functionality, and offer more value for our customers." Thomas Fjeld will take on a position as Vice President Planning and Navigation within StormGeo post-acquisition. Nautisk has formed part of NHST Media Group since its inception in 1896. "Nautisk is an established business with a renowned heritage set for a bright future, already spearheading the global, digital transformation of the nautical chart business. This combination with a broader maritime solutions business has a strong strategic logic that should further enhance its potential for success in a rapidly changing market," said Andreas Emblem, Head of Division at NHST Media Group. The transaction will close within the next month or as soon as practical, pending the fulfilment of certain standard conditions for completion. Financial details of the transaction are not disclosed. StormGeo is a global provider of weather intelligence and decision support services, with leading solutions for shipping, oil and gas, renewable energy, aviation, media and cross industries. StormGeo's shipping division leads the industry delivering routing and fleet performance solutions to more than 9000 vessels monthly. Following the acquisition, StormGeo will operate from 27 offices across 15 countries, including six operations centers operating 24/7/365 supporting customers worldwide. For more information, visit StormGeo.com. Nautisk has been supplying maritime charts and publications to the merchant marine since 1896, with a sole focus on the shipping market. Today, Nautisk is one of the world's leading chart agents with a global network of offices covering key shipping routes and markets, including Europe, the U.S. and Asia. For more information, visit Nautisk.com. NHST is a Norwegian media group. The Group owns the leading Norwegian publications DN and Morgenbladet as well as the global industry news businesses Upstream, Tradewinds, Intrafish and Recharge. NHST is also the owner of the B2B SaaS company Mynewsdesk which offers an all-in-one digital platform for communications professionals and Nautisk Forlag, an international maritime charts and publications business. NHST has an annual turnover of MNOK 1 300, approximately 750 employees and is owned 54 % by the stock exchange traded company Bonheur ASA.